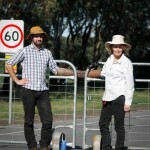 Three protesters who chained themselves to gates and vehicles to prevent Whitehaven Coal from accessing its Maules Creek mine site have been cut free by police and arrested. According to activist group Front Line Action on Coal the trio, who had chained themselves at Haul Rd, were cut from locks by police at around midday and taken to Narrabri police station. Protest spokeswoman Georgina Woods said one of the arrested people included 75-year-old first-time protester Raymond McLaren, Newcastle Herald reported. As Australian Mining reported earlier today, activists have formed a picket line at Whitehaven Coal’s Maules Creek mine development as part of their ongoing fight to stop the project going ahead. 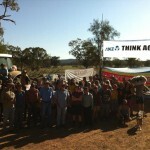 The protesters have been running a camp near Maules Creek for over 500 days with a spokesperson for the group telling Australian Mining that it was not planning on letting the issue go. They say the controversial coal mine will destroy the Leard State Forest, affect aquifers used by farmers and emit coal dust. Woods said as the movement gained attention more people were coming out to join the group. Last week activists posted a call to arms video calling for as many people as possible to help stop the mine. ‘‘From our perspective we see what’s happening today as the beginning of more and more people coming out here to defend this forest and stop this mine,’’ she said. Earlier, McLaren told AAP the state forest was not worth losing for a coal mine. "Our civilisation needs the mining industry but in this case, they are just going to destroy a forest for the coal that they want under it," he said. "The state forest out here is too precious to sacrifice – there's not much of it left." Whitehaven today issued a statement calling protests at the project sites “a nuisance” but said the company would not be deterred from getting on with the job of building Maules Cree mine. "Our primary concern in the meantime is that any protests are carried out lawfully and do not endanger the safety of mine employees and emergency service personnel," Whitehaven said. The $766 million project has seen fierce protest from some members of the local community and has been one of the more controversial development proposals since its inception. 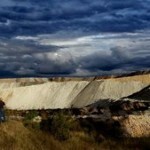 While the validity of the mine’s environmental approval process is being challenged in the Federal Court, with a decision pending. The mine will produce about 60 per cent semi-soft coking coal, and 40 per cent high-quality thermal coal. Once at full production, Maules Creek will produce 13 million tonnes annually, of which 10.5 million tonnes will be saleable coal.